Where your loved one feels like they are "Bone Sweet Bone!" Wrapping paper, tinsel, and ribbons are all part of the winter holidays. But these items — and other household hazards — can pose serious choking and poisoning risks to dogs, cats, and other pets this time of year. 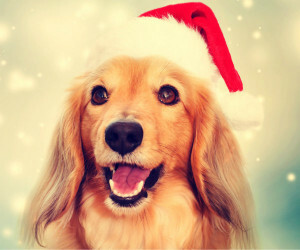 To keep your animals safe, the U.S. Food and Drug Administration has issued an advisory on holiday-related pet hazards. Here’s a roundup. Tinsel, wrapping, and ribbons: Christmas tree adornments, gift wrapping paper, and ribbons — like string and dental floss — pose significant hazards to cats that ingest them, says FDA veterinarian Carmela Stamper. Keep them away from pets at all costs. “Your cat may find these decorations irresistible because they look like easy-to-catch, sparkly, and wiggly prey,” Stamper says, noting they can cause serious stomach and intestinal damage. Buying or Adopting: How Did You Get Your Pets? Holiday plants: Holiday plants such as poinsettias, holly, and mistletoe can be poisonous to animals who nibble on them. Poinsettias have a milky white, latex sap that can irritate your animal’s mouth and stomach and may cause vomiting and diarrhea. “If your cat has snacked on poinsettia leaves, you can help him by picking up his food and water dishes for a couple of hours to let his stomach settle,” Stamper advises. The National Animal Poison Control Center says the major toxic chemicals in mistletoe are lectins and phoratoxins, which can affect the heart by causing low blood pressure and slowed heart rate. Holly isn’t as harmful, but in dogs and cats alike, the plant’s toxins can cause drooling, vomiting, diarrhea, loss of appetite, and decreased activity. Pet treats: Don’t allow your dog to overdo it on pet treats over the holidays. According to Stamper, if your dog eats the treats whole, or too many at once, he or she may not be able to digest them. Unchewed pet treats can get stuck in the trachea (windpipe) or gastrointestinal tract (esophagus, stomach, and intestines). If you’re worried your pet is suffering from distress from too many treats, consult your veterinarian. “When in doubt, contact your veterinarian, who may need to take x-rays or use an endoscope to see what and where the problem is,” Stamper says. Your dog may even need surgery to remove blockages in the intestines. Table scraps: Don’t give your pet table scraps that are high in fat, such as fat trimmed from meat or skin from your roasted turkey or chicken. “In addition to the typical gastrointestinal upset, rich, fatty foods can cause a potentially life-threatening and painful disease called pancreatitis,” Stamper says. The most common symptoms of pancreatitis in dogs include vomiting, stomach pain, restlessness, shaking, diarrhea, fever, and weakness. In cats, the symptoms are less clear and harder to notice, such as decreased appetite and weight loss. And be careful what you put in the trash can, where dogs may help themselves to turkey or steak bones disposed of there. “Don’t forget, once dinner is done, dispose of the leftovers and bones somewhere where your pets can’t get to them,” Stamper says. Human treats: Chocolate can be dangerous to your dog or cat. After eating chocolate, some pets develop life-threatening liver failure and bleeding disorders. Even mints can cause life-threatening problems for your dog if they contain xylitol, also found in food items such as candy, gum, some peanut butters, and baked goods, and personal hygiene products, such as toothpaste and mouthwash. Symptoms occur quickly after dogs eat xylitol-containing items, and include vomiting, low blood sugar (hypoglycemia), decreased activity, weakness, staggering, incoordination, collapse, and seizures. Alcohol is also toxic to pets, who can suffer vomiting, diarrhea, incoordination, weakness, decreased activity, difficulty breathing, and shaking. In severe cases, coma and death from respiratory failure can occur. “Don’t accidentally leave your eggnog on the coffee table,” Stamper says. Should the Government Do More to Assist Animal Shelters? © 2015 NewsmaxHealth. All rights reserved. Ronin is a fiesty feline who is commonly known by me fondly as... "The Beloved Tuna Queen." She has earned this regal title because she LOVES, LOVES, LOVES, freeze-dried large flaked tuna. Ronin has recently within the last year or so relocated to Wichita from Alaska where I'm sure she picked up her "Tuna Addiction." She's a feline with an attitude, and a personality like none other which is why she earned A Bone Sweet Bone's Client of the Month for December. I cannot give my sincere appreciation and gratitude enough to Ronin's owner for giving me the opportunity to care for such a delightful creature in her absence. Merry Christmas and a Blessed New Year to all of you. May 2016 bring in much Joy, Happiness, Good Health, Prosperity, and Blessings to you and your families. May you All Have Safe Travels too! No comments by Bu yet.